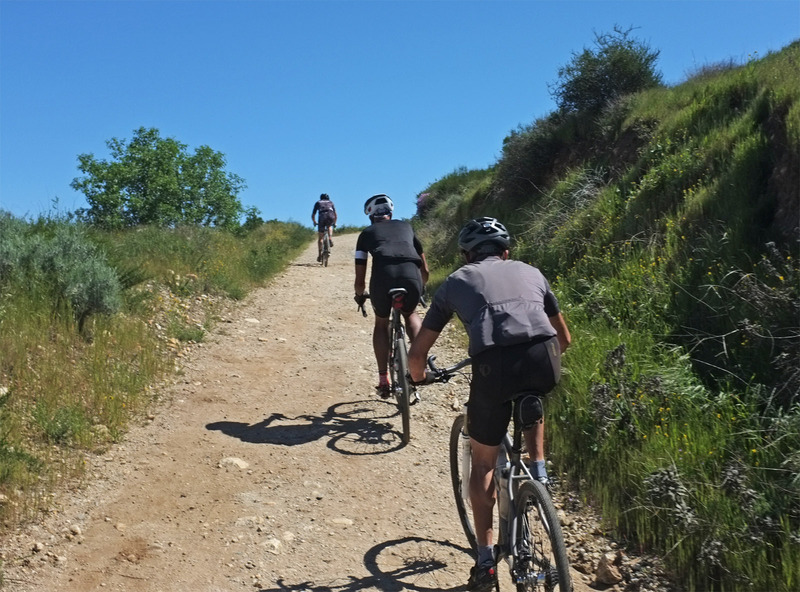 Any mention of the Santa Clara Truck Trail elicits a nerve racking response of redemption for me. 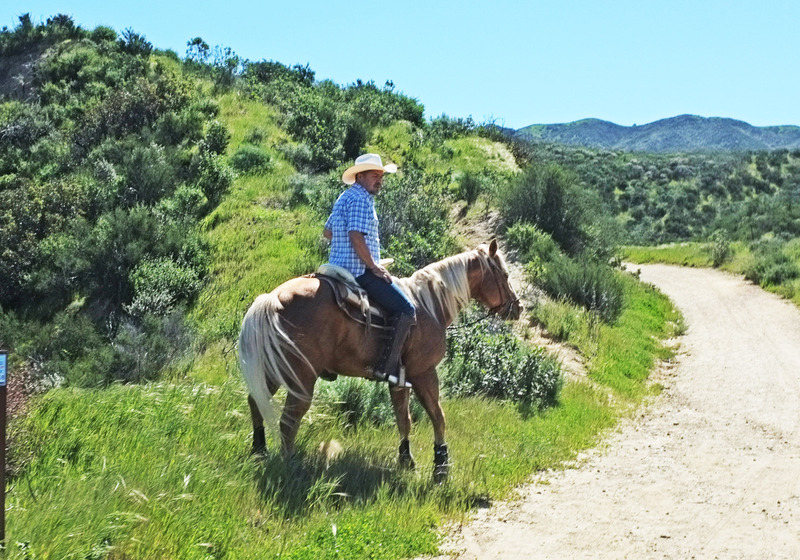 As the longest stretch of dirt lining the edge of the Santa Clarita Valley, there are plenty of opportunities for excursions both long and small. 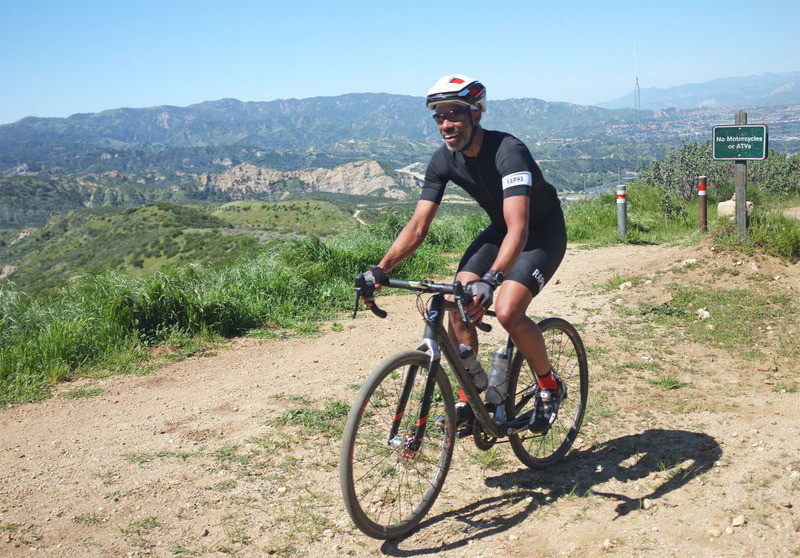 My last outing covering the portion from Angeles Forest Highway to Bear Divide was epic at first, but became increasing tragic throughout the ride. This time, we were covering a short section on the western side of it starting from Whitney Canyon to May Canyon. 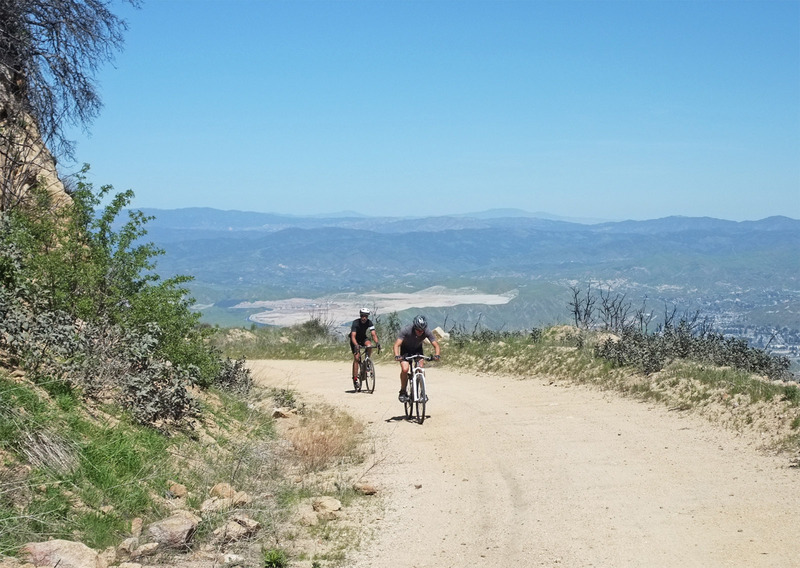 It’s just a 5.8 mile climb…..with 2,400 feet of elevation! Just coming off the first portion of our loop climbing Sulphur Spring Road down into East Canyon, our group was feeling pretty good. 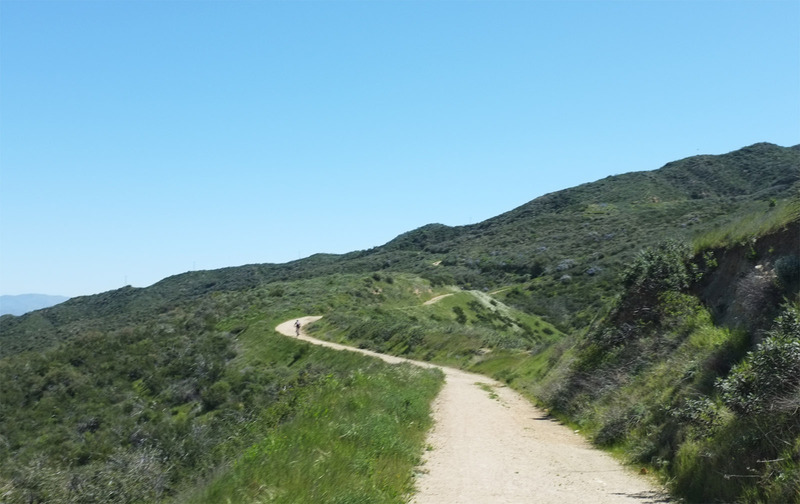 So far, it was the ideal time of the year where temperatures weren’t hot, yet the trails were relatively firm. Finishing off on a high from the first part of our adventure climbing Sulphur Spring Road, we headed down the Old Road and turned back up Sierra Highway. Riding these two ancient predecessors nestled right below their modern freeway counterparts gives you a glimpse of a time when movement was simpler, especially when riding on a quiet Saturday. 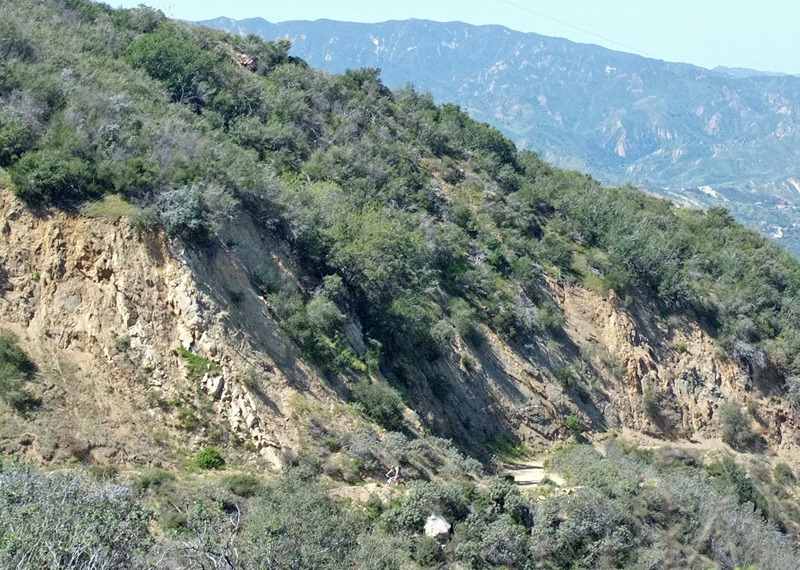 One gem most people miss is this little nook in the center of the picture as you enter Santa Clarita that served as the first pass through the area. 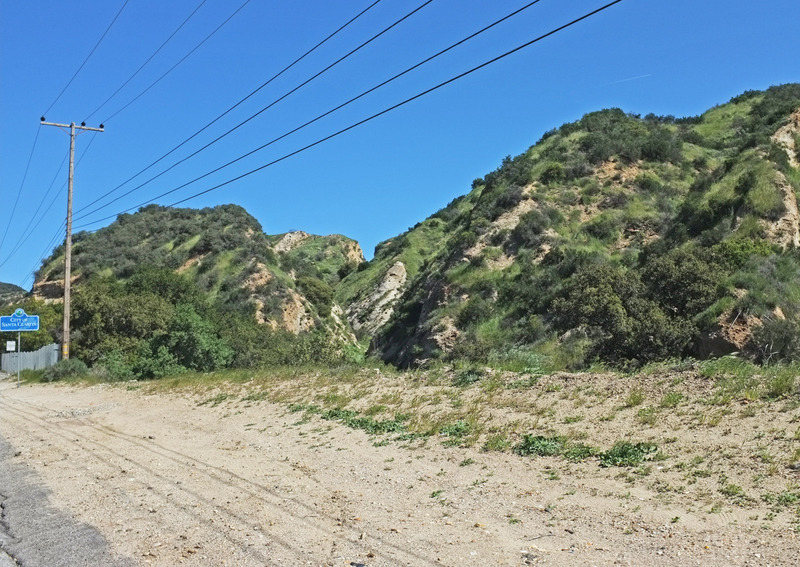 Beale’s Cut predates the Civil War as Phineas Banning created this opening as a way of navigating Newhall Pass in 1854 which ended up serving the area for over fifty years. Now, it’s just a hidden side note on the side of the road most people miss especially after its partial collapse after the Northridge Earthquake. Great Scott!! 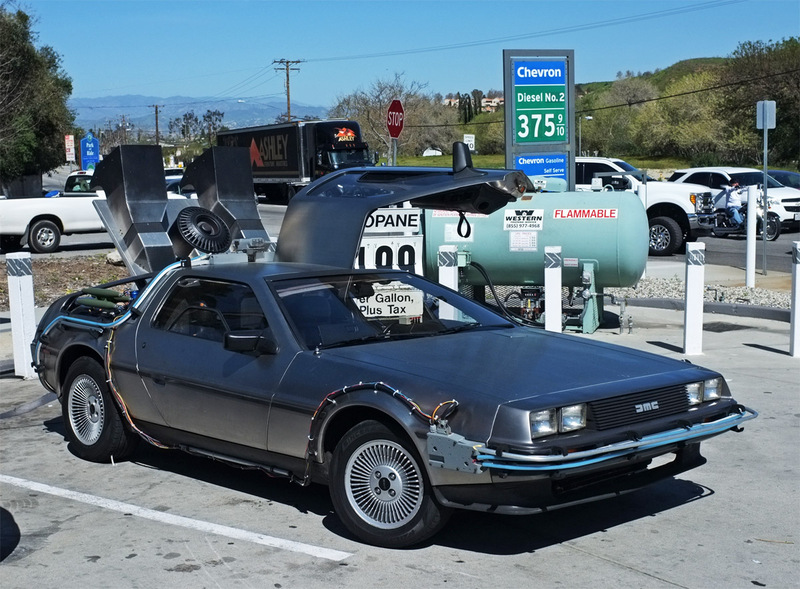 You know I love all this Eighties and I was pretty tempted to steal this things and take this ride to 1.21 gigawatts! Instead, we just filled up with water at the Chevron on Newhall, but learned this car is for rent. Rolling out of Whitney Canyon Park is a bit of a punch to the face, but a good one as you start this climb. If you aren’t ready to climb into double digits of grade for an extended period of time, this will let you know right away. 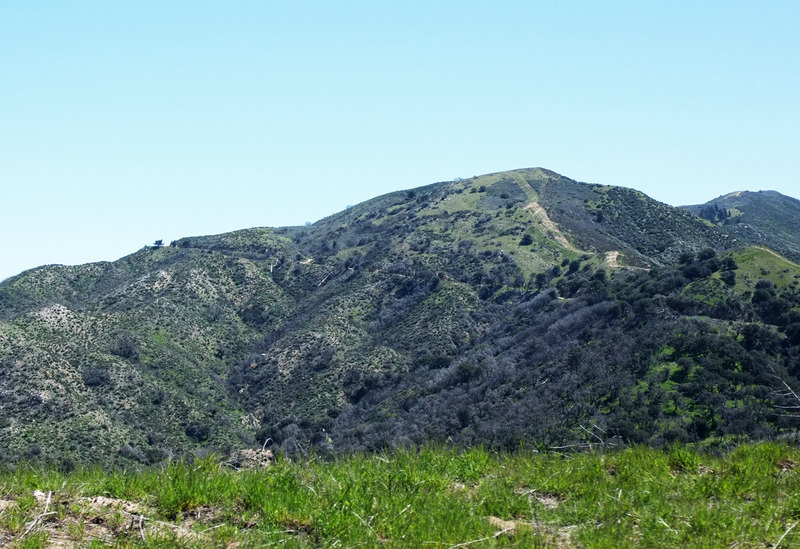 What a welcome back into the Angeles National Forest. Despite the climb, we still caught these cowboys we could see further ahead pretty quickly. We exchanged a few friendly smiles and approved of the music they were playing in their boom box as we passed. After riding near a ledge for a good period, the road opens up a bit. It’s nice to start having a sense of where you’re going, until you realize it may be painful. Halfway up, the Santa Clarita opens up to and you can start place making to figure out the scale of how big this valley is. Once again though, I don’t have to mention any wavering of Vic’s smile, but we are only about halfway up at this point. Maybe you can spot the mountain biker on in the photo above. He barely acknowledged us as we passed, but when climbing a beast like this, you know some people keep their head down trying to stay focused. 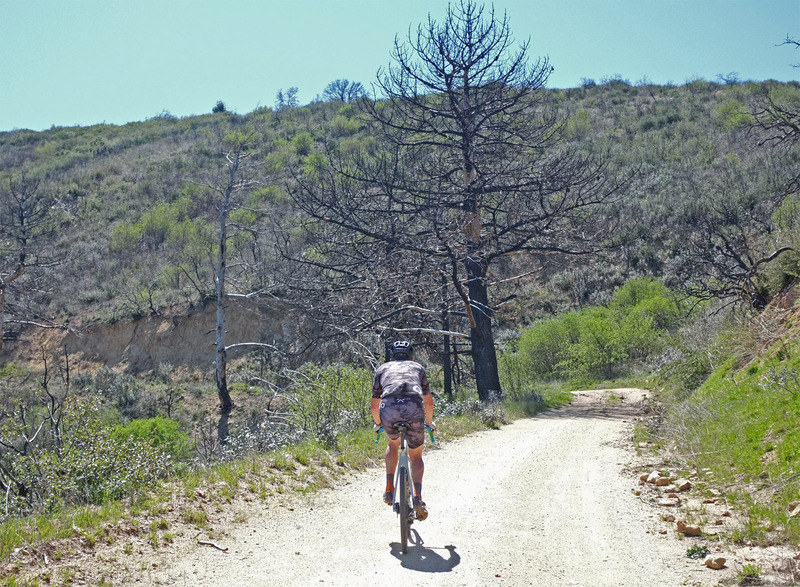 The ability to look where you’re going during climbs probably does more harm than good. I try to not look at the distance left, but at the beauty of a road linearly cut into the mountain. As we made our way to the junction, remnants of the Sand Fire became more prevalent. At least things got a little flatter. One last look back as the ride crests. We finally hit the junction where we turn off onto May Canyon. The antennas you see behind Bill’s head is Camp 9 where you can get water and connect to Little Tujunga. 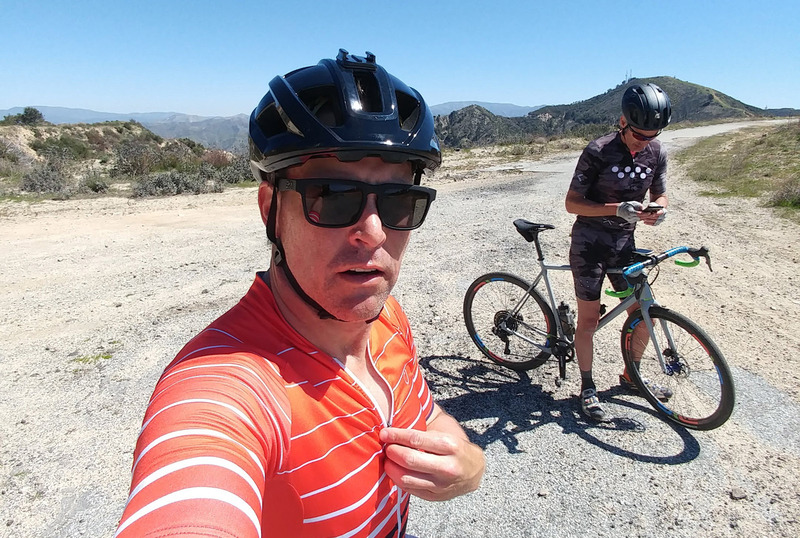 For me, it was time to zip up before a little five mile descent down May Canyon. 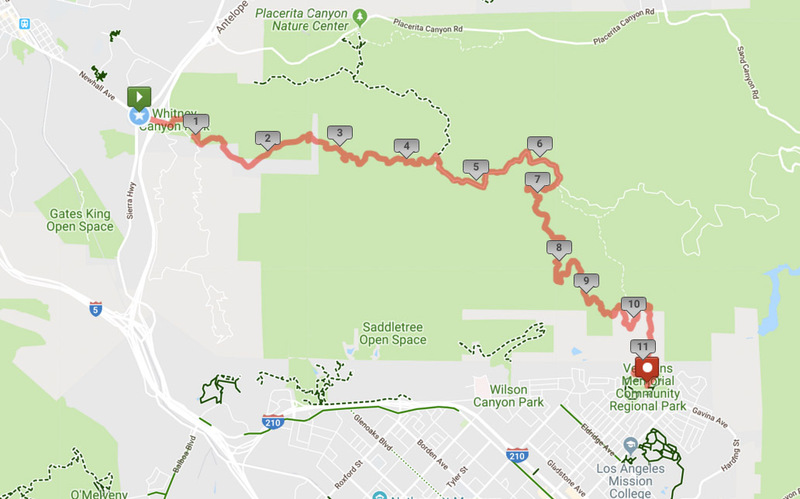 For those not familiar to the area, I liken the conditions of this closed road to that of Vista del Valle in Griffith Park (except much steeper). It’s mostly pavement, but you have to be aware of the occasional cracks and patches of dirt. Otherwise, it’s a pretty fun descent that can be distracting because of the sweeping views as Babak showed. No reason to read on from here….except this happened…. This was pretty much the same fall I had the last time I was on Santa Clara Truck Trail except this time I was filming. Luckily, I’m experienced in going down and I ended up with no damage to the bike with just a couple of scrapes to the skin. I credit this smoothness by employing a head first Pedro Guerrero inspired slide and science may say it’s a proper way of dispersing energy. Nonetheless, with under forty miles of riding, we sure saw a lot in a short amount of time. These mountains are full of riches and it keeps exciting me that no matter how much I ride, there’s always more.